Are you part of a group of people that garden together (whether it be in your neighborhood, at your school, worksite, church, housing complex, or any other place)? If so, if you and your group consider it a garden (no matter where it is), so do we and we would love for you to tell us about it. The ideal person to complete this survey is the Community Garden Leader(s). Who wants this information and what will it be used for? The NC Community Garden Partners is made up of people from community and faith-based organizations, universities, public health and others who are interested in creating a strategic plan and statewide organization for community gardens. This survey is the first action step that the Partners are taking in that effort, and results from it will help us to know about and promote the community gardens in NC through the NC Community Garden website --click here (http://www.ces.ncsu.edu/depts/hort/garden/CommunityGarden/) and other sources. If you want to learn more about the NC Community Garden Partners and get involved, visit the NC Garden website and/or join the Community Garden listserve click here (http://lists.ncsu.edu/cgi-bin/mj_wwwusr?user=&passw=&func=lists-long-full&extra=nccommunitygarden). The survey will only take 5 minutes to complete. If you received an email link and are completing this via the web keep going! Please share this survey with others who are involved in any way with community gardening efforts and ask them to fill it out it as well. We hope everyone will complete this survey ASAP, but will continue to keep it open so that gardens can continue to be registered. We have posted the first two months of the survey results on the website above. Thank you very much! * 1. What is the name of the community garden? * 2. What is the physical address of the community garden? * 3. Who is the primary contact person for the garden? * 4. What organization or agency is primarily affiliated with the garden? * 5. What type of organization/agency is the primary affiliate of this garden? * 6. Who is welcome to participate in the garden? Limited to members of the sponsoring organization, school, faith community, etc. * 7. What is the Size of your garden property? * 8. How many individual plots are in your garden? * 9. How many people garden at your site? * 10. Do you have enough space and ability to allow more people to join your garden? * 11. Who owns the land that the garden is on (if known)? * 12. What uses are available in this garden (s)? Check all that apply. * 15. Which other organizations partner with, or support this garden (financial support, technical assistance, source of volunteers, marketing, etc. ), if any? * 17. 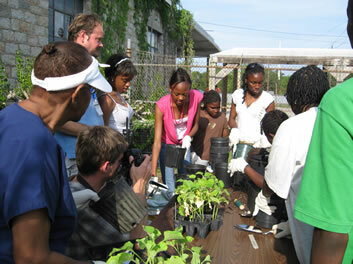 Do you have any additional comments you’d like to share with the NC Community Garden Partnership members?